Phonte was on hiatus since the last Foreign Exchange album dropped. Also, since there is no more Little Brother, it really wasn't clear what direction (if any) his career would take. Phonte was the standout mc from Little Brother, the biggest contributing mc on the Foreign Exchange albums and now here presents his debut solo project where he doesn't disappoint. Teaming up with 9th Wonder on a couple tracks reminds you of the magic Little Brother embodied (including Big Pooh). Along those same lines, Elzhi is featured on a track called Not Here Anymore, reminiscent of the classic track Hiding Place from The Minstrel Show. If you're up on my album reviews, you know I'm a huge Elzhi fan. Phonte and Elzhi compliment each other very well and I look forward to hearing more collabos with these two extremely talented mc's. Other featured artists on Charity Starts At Home include Evidence, Eric Roberson, Carlita Durand, Big Krit, Sy Smith, Jeanne Jolly, Elzhi, Pharoahe Monch and Median. Featured producers include 9th Wonder, Khrysis, Swiff D, E. Jones, Fatin 10, Stro Elliot, S1, Zo! And Phonte. If you're not familiar with Phonte's style, he has a relatively slower flow, but he's funny and he often talks about the struggles of being monogamous. 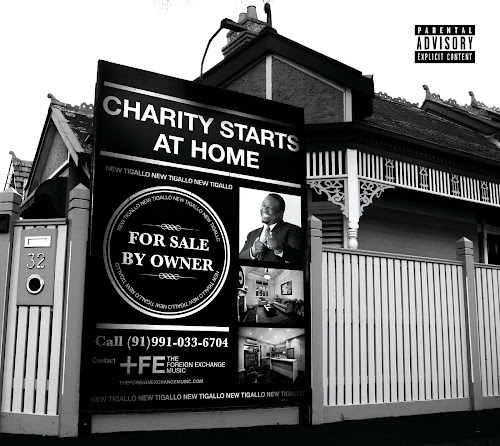 Charity Starts At Home is an album that isn't going to get mainstream attention because Phonte isn't aligned with the typical catch phrases & themes of 2011. So, check it out and support real, genuine hip hop artists! In Album Reviews, Blog Tags 9th Wonder, big krit, big pooh, carlita durand, charity starts at home, e- jones, elzhi, eric roberson, evidence, fatin 10, foreign exchange, jeanne jolly, khrysis, little brother, median, pharoahe monch, phonte, s1, stro elliot, swiff d, sy smith, ZO!